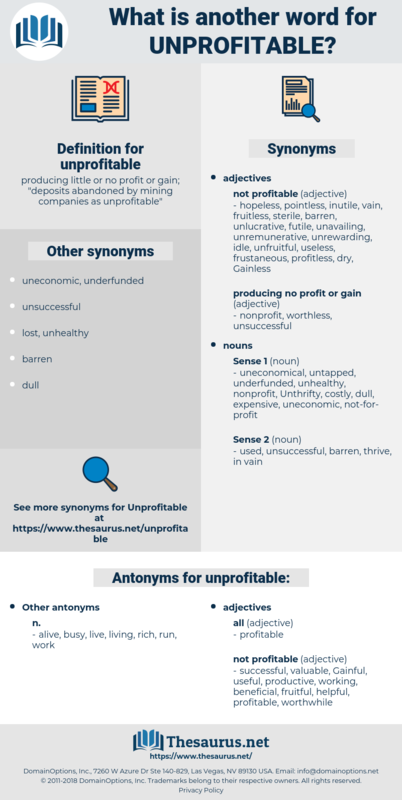 What is another word for unprofitable? 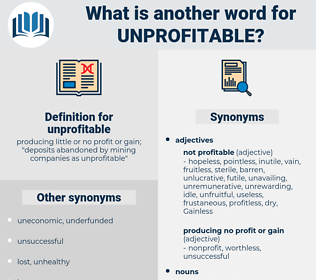 producing little or no profit or gain; " deposits abandoned by mining companies as unprofitable"
wasteful, non-profit, cost-effective, lucrative, viable, worthwhile, not-for-profit, cost-efficient. uneconomic, unviable, uneconomical, inefficient, unproductive. helpful, fruitful, productive, working, valuable, successful, worthwhile, Gainful, useful, beneficial. efficacious, competent, real, remunerative, realizable, virtuous, practical, applicable, bankable, feasible, deadly, functional, lucrative, advantageous, potent, efficient, practicable, expedient, adequate, juicy, moneymaking, sufficient, fat, meaningful, serviceable, powerful, economic, workable, paying, substantial, solid, effectual, worthy, valid, sound, paid, usable, effective. alive, busy, live, living, rich, run, work. It was hoped that Spain would view these injuries in their proper light; if not, then the United States must join in the unprofitable contest of trying which party can do the other the most harm. Why, my dear father, what an idle, unprofitable, weary world would this be, if it were based on equality!